1) Training and equipping through our Advanced Minister's SRA Training Academy. 2) Connecting trained ministers with those in need through our Referral Network. 3) Providing recovery & training resources through our Store and Free Resources page. 4) Serving the global community through strategic intercession, workshops and conferences, see our Events page (coming soon). 5) Supporting our local community through the Apostolic Healing & Equipping Center and the gathering of the Ekklesia (Coming soon). If you want to contribute to support these efforts, visit our Give page. We have big plans ahead! We are building a Christian consortium for experts in DID/SRA recovery to further research, education and solutions for SRA and severe trauma recovery. More books, DVDs and resources will be developed to support the needs of survivors and those who love them. Did you know that occult ritual abuse and mind control programming are primary elements of slavery for those being sexually trafficked? At Revelation Gateway we are working on solutions to bring awareness to the public and freedom to the captives. Kay met prophetic artist David Munoz at Glory of Zion in Corinth, Texas in 2014. There David was selling prints of his artwork, including the one pictured above. Kay's friend Alea purchased this print from David titled "Revelation Gate" and she gave it to Kay as a gift. It was one of David's first creations. In May of 2015, the Restoration Gateway ministry office was destroyed by fire, along with the print. A year or so later, Alea went on to be with the Lord. But in the midst of this tragedy, the Lord promised to restore everything that had been lost. In the autumn of 2018, the Lord instructed the leadership of Restoration Gateway Ministries to dissolve the 501c3 and begin again, under a new structure, in a new wineskin. 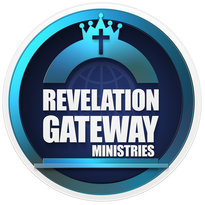 The name the Lord gave the new ministry was Revelation Gateway Ministries. We were to move from restoration to revelation for the outpouring of the new wine in the Kingdom of God. Kay approached David Munoz to create a new logo and website design for the new wineskin. At the unveiling of the new design, David exclaimed, "I knew this image was for you!" "Every day we are crossing over into a fresh understanding and revelation of walking as sons and daughters, heirs, warriors, a holy nation and sharers of Light. A “Revelation Gate,” a new path opens for everyone to walk, sing, dance, govern and think like one, with the voice of God in every mouth and mind. I can see the Issachar tribe anointed holy garments, transformed tents, with people from every tribe, tongue and nation coming together to take dominion and power, tearing down structures of darkness with wisdom from heaven under them! Amen!" Kay Tolman is the Co-founder and CEO of Revelation Gateway Ministries, LLC, and Owner of Revelation Gateway Publications, LLC founded in 2013. She also provides leadership for the Portland Apostolic Healing and Equipping Center, located in NW Portland. Kay was ordained and released into ministry by Apostle George Musk, in 2004. She ministered as part of Glory Winds International Ministry for three years, before opening Restoration Gateway Ministries in 2007. Restoration Gateway Ministries was a 501c3 non-profit religious organization for which she served as President for eleven years. Kay was also commissioned by Glory of Zion International, Global Spheres, Inc., Generals International, and HAPN. With a Master of Christian Counseling degree from Christian Leadership University, Kay specializes in training ministers to effectively serve those in severe trauma recovery. She has developed biblically based methods for healing the broken heart, DID integration and mind control deprogramming, as well as advanced deliverance strategies specific to occultism and witchcraft. She travels nationally and internationally as an author, speaker and teacher. Kay Tolman is the author of Satanic Ritual Abuse Exposed; Recovery of a Christian Survivor and Moved with Compassion; A New Wineskin for Healing and Deliverance. Her other works include Serving SRA Survivors and Mithraism Deliverance and Deprogramming. Kay has been married over 30 years. She and her husband have four adult children and five grandchildren in the Pacific Northwest.